With the news of the new super hospital there’s a big question about planning our health facilities. What do we need? When and what will it look like? A new conference asks the questions. A briefing on integrating planning, active travel and health for practitioners working in local planning authorities and health organisations in Wales will address Planning for Better Health and Wellbeing. 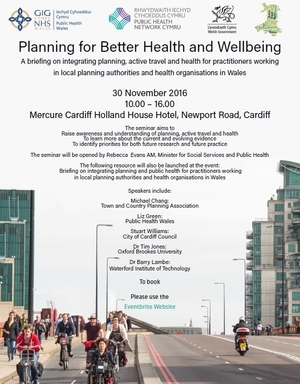 Save the date: Public Health Network Cymru are holding an event on30th November 2016 from 10.00 – 16.00 at Mercure Cardiff Holland House Hotel, Newport Road, Cardiff. To book please use the EventBrite website.